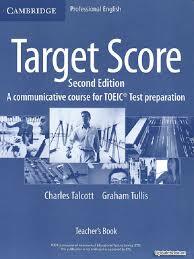 Target Score Teacher Book Toeic (Ebook). Get Best TOEIC Preparation Materials and Practice Book for Reading, Writing, Listening, and Speaking. Get TOEIC Materials , Tips, Tricks. Practice more and boost your score. Target Score Second edition is a preparatory course for the new TOEIC Test Fully revised to meet the needs of the new TOEIC Test, this Second edition also provides effective, classroom-friendly lessons for active, communicative English.